Heading to Designer Con this month? I’d say if you weren’t planning to, you might want to reconsider, if for nothing else than to get your paws on this Devil Bear. 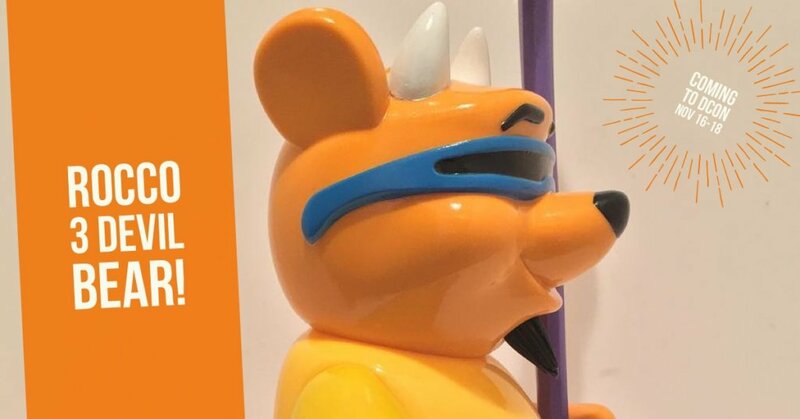 I don’t know if it’s the nostalgia of the Pooh Bear look, the Geordie LaForge visor nod, or the flipping epic devil horns, goatee, and pitchfork but I am stoked about this guy. Being a newb to the scene I didn’t even realize that this was based off a Steve Rocco board graphic! To see something so iconic being redone in an actually Made in Japan sofubi & attracting totally new fans (like myself) is really cool. Now I can’t wait to get my hands on both (hopefully)! Black book toys posted photos of the sofubi test pull of Monster Farm Chop’s sculpt this weekend and started our week off with Marc McKee’s paint sample photo. Check out this photo for representation of size! This is one. big. bear! He stands at 10″ tall (25cm as shown) ! This 10-piece sculpt is simply PERFECT. The paint masks and tee shirt graphics will be done in-factory for the rest of the Devil Bear army meaning clean cut lines and a dope finished product! The articulating limbs mean you can pose him in so many awesome ways apart from just how the OG board portrayed him (let’s have some photo-ops here!). Keep your eyes out at DCon for this and in the meantime, head over to check out Marc McKee’s Instagram and website, and Monster Farm Chop’s Instagram to see more of these great releases and updates! Not sure about where and when Designer Con is? No problem. DesignerCon 2018 will be held in Anaheim, CA, November 16-18. BlackBook Toys will be at booth 644 and THAT is where this pot of honey will be chillin’. Check out the DCon website for more info!